Two years ago, you may recall me having a Yard Sale to buy a van. We got friends, co-workers, neighbors AND strangers to donate things to sell. And still others came to BUY all this great stuff! In the end, we did not raise all the money needed to buy a used wheelchair van, but it sure helped! We had a whole media blitz too! The van has really changed my life and has allowed me to get around especially now that I am wheelchair bound. This spring we decided it’s time to get the downstairs ready for me to live in. I have ALS. It’s harder for me to sit up now without flopping over. I don’t have any use of my legs and can’t stand on my own. Although I have a stairlift, I don’t feel as safe as I once did riding it up stairs. Also, at this point my husband is the only person that can lift me. Once the bathroom downstairs is completed, with ADA compliant fixtures and a walk in shower, I still need to install a lift and create a bedroom in our family room for me to sleep. Having me on one floor and the lift, will allow others to help take care of me when my husband can not or has to work. I have taken out money from my retirement to help with the costs. It’s not even half of it. I still work so I couldn’t get all the money out. I hope to get some grants to help as well. My dear friends decided to help too. Here’s a recent article about my friend and co-worker Gretchen! They have created and planned another amazing household garage sale for this month! There is stuff coming to the house in droves! We even have a donated storage pod from Gary LaPietra, General Manager & COO, at Clark Moving & Storage Inc! And thank you to Crystal Rock! They are donating bottle water for the event! 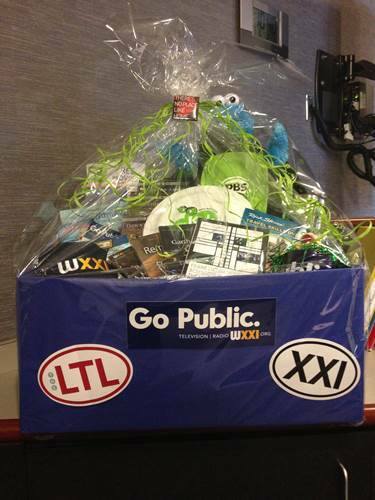 We will be raffling off a few items including this beautiful basket of goodies donated by WXXI Public Broadcasting & The Little Theatre. The basket includes: 3 seasons of Downton Abbey, Restoring a Masterpiece (Frank Lloyd Wright House documentary), a Garth Fagan documentary, Dr. Wayne Dryer book, Rick Steve’s travel tips, tickets to the Little, mugs for the Little and WXXI, a Cookie Monster doll, a recording of bands that played at the Little, a PBS Kids backpack, and a WXXI hat and Frisbee. More community love! Big shout out to Hegedorns Market in Webster for donating hotdogs for the Garage Sale! We will have food for sale on Saturday, July 20th! The AWESOME “consider it done” team at AVALON DOCUMENT SERVICES donated boxes for our raffle entries AND sent us complementary cookies with them to boot! I am so touched by the love and spirit of the people in and around my life! All clothing and cloth items were donated to a local church – Church of the Resurrection in Fairport. All the items that did not sell were donated to the VOA.